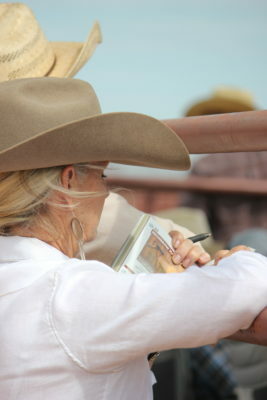 Maggie Bellville’s passion for the american quarter Horse and our industry is immediately clear. 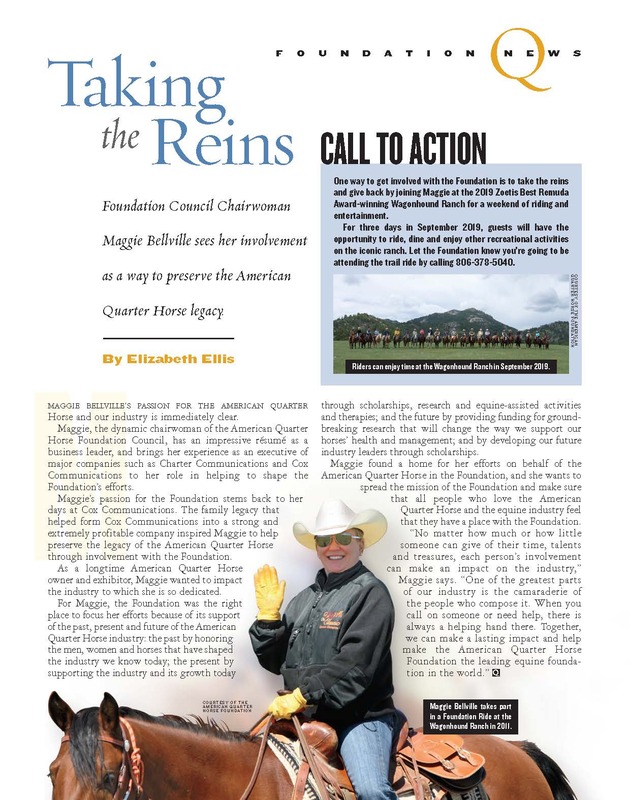 Maggie, the dynamic chairwoman of the American Quarter Horse Foundation Council, has an impressive résumé as a business leader, and brings her experience as an executive of major companies such as Charter Communications and Cox Communications to her role in helping to shape the Foundation’s efforts. Maggie’s passion for the Foundation stems back to her days at Cox Communications. The family legacy that helped form Cox Communications into a strong and extremely profitable company inspired Maggie to help preserve the legacy of the American Quarter Horse through involvement with the Foundation. As a longtime American Quarter Horse owner and exhibitor, Maggie wanted to impact the industry to which she is so dedicated. For Maggie, the Foundation was the right place to focus her efforts because of its support of the past, present and future of the American Quarter Horse industry: the past by honoring the men, women and horses that have shaped the industry we know today; the present by supporting the industry and its growth today through scholarships, research and equine-assisted activities and therapies; and the future by providing funding for ground-breaking research that will change the way we support our horses’ health and management; and by developing our future industry leaders through scholarships. Maggie found a home for her efforts on behalf of the American Quarter Horse in the Foundation, and she wants to spread the mission of the Foundation and make sure that all people who love the American Quarter Horse and the equine industry feel that they have a place with the Foundation. The Return to the Remuda Sale, slated for October 6 in Guthrie, Texas, is an annual partnership presented by Four Sixes Ranch, Beggs Cattle Company, Pitchfork Land & Cattle Company and Tongue River Ranch. The 2018 sale will include guest consignors King Ranch and Wagonhound Land & Livestock. 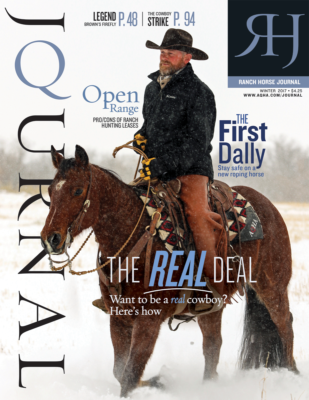 Three of these historic ranches are winners of the prestigious AQHA Best Remuda Award, which recognizes outstanding ranches for their efforts in raising American Quarter Horses. Each year, participating ranches choose some of their top horses to offer to the public, including weanlings, yearlings, 2-year-olds, fillies, stallion prospects and riding horses. Buyers of each consignment will be placed into a “buyer raffle” for a chance to take home a custom-made saddle by Jeff Smith Saddlery. A sale horse demonstration and preview are scheduled for Friday, October 5. 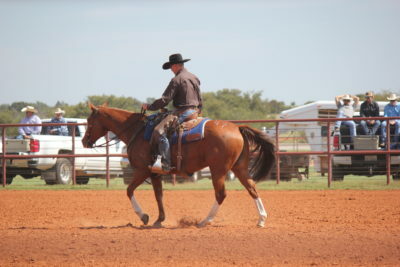 Both the demonstration and sale will be held in the new covered arena at the Four Sixes Ranch in Guthrie, Texas. Also, during the sale, there is an American Quarter Horse Foundation Benefit Auction that consist of numerous ranch-type memorabilia such as art, jewelry and spurs. 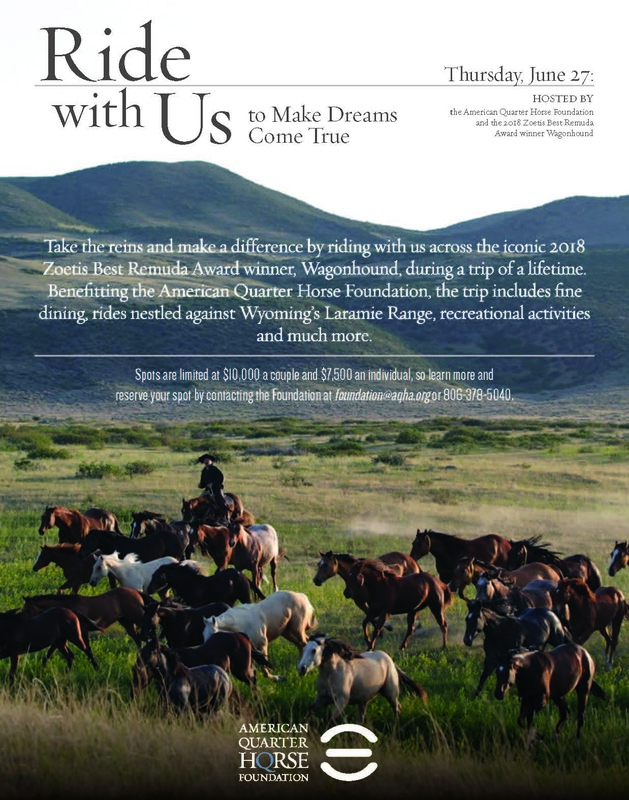 The proceeds will assist foundation programs which support equine research, America’s Horse Care Therapeutic Riding and the American Quarter Horse Hall of Fame & Museum. 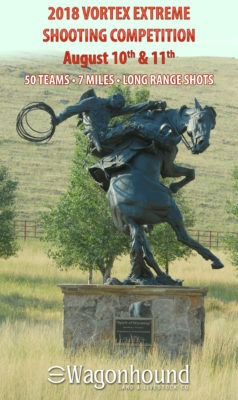 In addition, attendees will have the opportunity to view the hosting ranch’s chuckwagons and shop their on-site booths for memorabilia and other merchandise. For more information: The Return to the Remuda Sale Facebook page or 6666ranch.com. 2018 Vortex Extreme Shooting Competition August 10th & 11th, competition to take place at Wagonhound Land & Livestock! In a press release Wyoming Governor Matt Mead announced the State of Wyoming and the Wyoming State Fair will host the 2018 Vortex Extreme – a hunting inspired, team based shooting competition “where endurance and accuracy meet”. The Vortex Extreme will headquarter at the State Fairgrounds and competition will take place on the Wagonhound Ranch above Douglas, Wyoming. 385 Red Angus Heifers to Auction on November 30 at Superior Select Female Online Auction! 8 Lots will sale at approximately 3 pm CST. Wagonhound Land & Livestock Awarded the Red Angus Commercial Producer of the Year in 2015 for use of Red Angus Genetics & promotion of Red Angus marketing program. 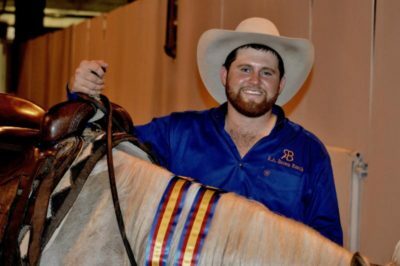 Article provided by National Reined Cow Horse Association – NRCHA Snaffle Bit Futurity – October 14,2017 – Lanham Brown had to overcome a tragedy to be triumphant at the 2017 NRCHA Snaffle Bit Futurity, but with a little help from his friends, that’s exactly what the second year competitor did. Riding This Shiney Miss, a horse that was gifted to him by Wagonhound Land And Livestock, Brown marked a composite score of 638.5 to be the Intermediate Non Pro Champion, the Novice Non Pro Champion and place third in the Non Pro for check amounting to $23,103. “It’s a great accomplishment. It’s something that I’ve looked forward to all year although it’s the journey, of training her throughout, that I’ve enjoyed the most. I’m really proud of this mare,” Brown said. The journey for Brown and This Shiney Miss (WR This Cats Smart x Shiney Miss Hickory x Shining Spark), who was worked as a 2-yaer-old by Matt Koch and Matt Frederick, began a year ago when he got a call from Wagonhound Land And Livestock in Douglas, Wyoming. Brown and This Shiney Miss marked scores of 209 in the reining, 218 in the reining and 211 in the cow work. It’s the mare’s grit that Brown likes most about her. Brown attends Texas Tech and is involved in his family’s ranching business. 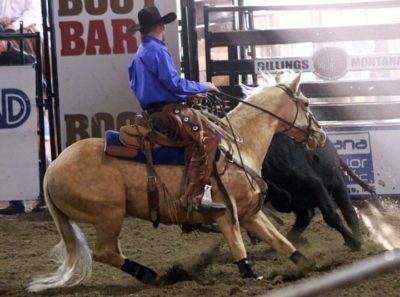 He and his cousin, Myles Brown, who won the 2017 NRCHA Snaffle Bit Level 1 Limited Open and the Limited Open championships, both started competing in reined cow horse at the same time. “We point out each others faults quite well but we’re also each others biggest supporters. We work with each other and try to help each other out when we can. We’re both really green but we’ve both been blessed with some really good horses,” Lanham said. Lanham would like to thank his parents, Donnell and Kelli Brown, for their support as well as all the trainers, including Matt Koch, who have helped him learn about training cow horses.